Any business, be it retail or online, needs reporting mechanism to keep track of the performance of the business. In this plugin, there are several reports which are generated to give you an insight into each part of the business process. But it is essential that we have a list of all reports segregated that helps you to understand the progress of online sales at a glance. Hence in this post, we will help you understand 7 different abandoned carts reports in Abandoned Cart Pro for WooCommerce plugin. All of these have been discussed in detail in many of our earlier posts but this post is written especially to get your hands on ALL the reports available in this plugin, in one go. If you wish to know the details of each individual reports, simply click on the name of the reports list mentioned above to get redirected to the post which was written earlier. So now let us look into these reports and understand what report will give you which data that would help you in performance analysis. This widget appears on the WordPress dashboard which displays abandoned and recovered cart’s data for the present day, current and last month as well as a total number of abandoned and recovered carts from start until the present day. It also shows you which product was abandoned maximum times as well as recovered maximum times. Thus this widget allows you to make suitable analysis for cart abandonment and recovery mechanism. This is a Dashboard which appears within the Abandoned Cart Pro for WooCommerce plugin. It is a very significant area of this plugin as it showcases the complete online sales scenario with up-to-date data on abandoned and recovered carts, total emails sent, open and closed as well as total recovered revenue. This area serves the purpose of understanding which email templates are more effective in recovering the abandoned carts and which are not. 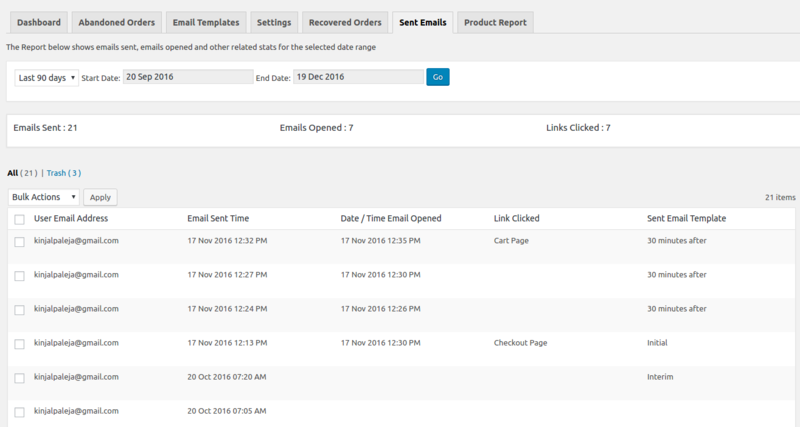 You can get a complete report of all email templates with data related to a number of times reminder emails were sent, its Open Rate means how many emails were opened by the customers. Similarly, Click Rate implies the number of times customer clicks on the checkout or cart link from the email to complete the transaction and Recovery Rate will show the percentage of abandoned carts which were recovered. 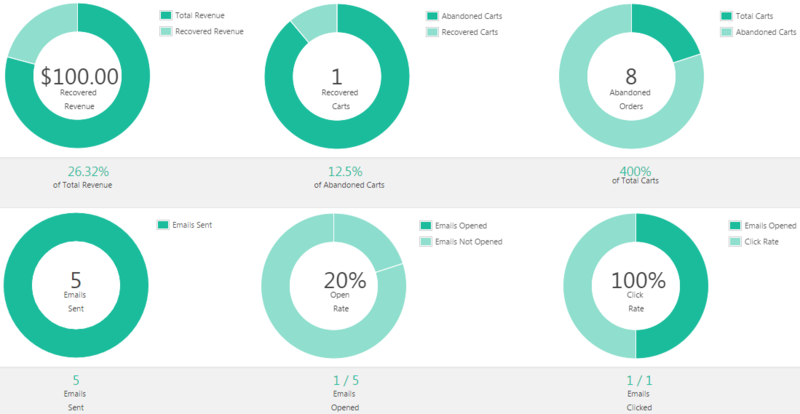 This report shows the number of abandoned cart reminder emails sent to potential customers and the number of abandoned carts that got converted into successful transactions. Thus noting the % of recovery through email reminders that contributed to the increased online revenue of the business. This tab displays the total number of abandoned carts and its total revenue which was lost due to abandonment along with total recovered revenue contributed from the number of recovered carts by applying this plugin’s techniques. The below result’s area of Recovered Orders Tab showcases the report of all carts that were recovered by sending reminder emails to potential customers encouraging them to complete their transactions. Similar to Recovered Order Tab, Sent Emails Tab displays data on a number of abandoned cart reminder emails sent to customers, the number of the emails which were opened by them and the number of times the shopping cart or checkout links within the emails which were clicked by the customers to successfully complete their purchase. This area displays a complete product report considering all the abandoned carts, reminder emails sent and recovered carts. It specifically shows a total number of times abandonment and recovery of each product took place along with the total revenue abandoned and recovered. This clearly states the how many times the product was abandoned and recovered with that product’s total abandoned and recovered revenue which helps to understand which product’s performance or sales is up to the mark and which one needs alterations. This post was written keeping in mind all the merchants that would require knowing the complete stack of reports and the data that can be gathered from them to quickly estimate the performance of the business through online sales. This is a one-stop post for all the reports generated through Abandoned Cart Pro for Woocommerce plugin, thus helping you to make appropriate decisions by evaluating the data for altering the present scenario to favor the future goal.